If you’re financially savvy, you likely know that you should have a bit of money stashed away in your savings account. While many people save for unexpected emergencies or expenses, it’s also a smart idea to save up for the future. No matter your savings goals, the best way to quickly stockpile savings is to make extra money – and your savings account could help you do this. If you place your money in a savings account at your local bank, you’ll earn interest. Unfortunately, the interest rates of savings accounts at traditional banks are very low, with an average interest rate of just 0.06 percent APY. And the largest banks in the country offer shockingly low interest rates of just 0.01 percent APY. If you’re trying to save, it’s smarter to choose a high-interest savings account instead. You could earn hundreds of dollars more each year with high interest savings. Here’s why you need to consider a high-interest savings account that can allow you to save money much faster. High-interest savings accounts are similar to traditional bank accounts, with a few important differences. 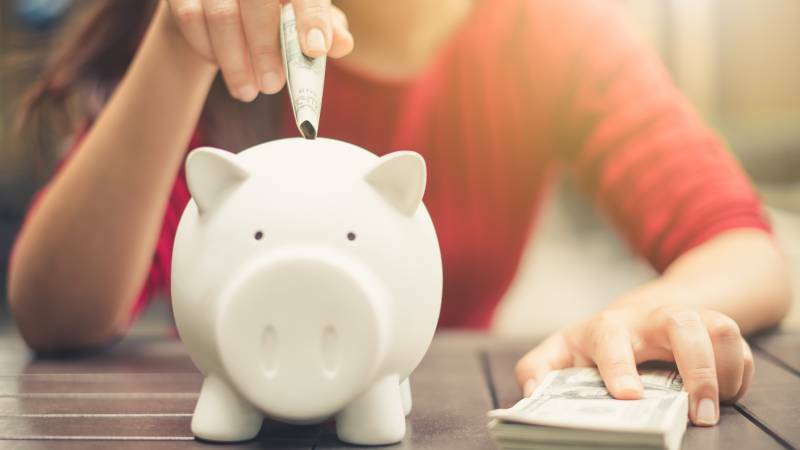 First and foremost, high-interest savings accounts give you more interested, and they’re typically offered by online-only banks. Since these banks are online, they don’t have the same overhead costs as traditional brick-and-mortar banks. This allows them to pay much higher rates of interest to people who open savings accounts. The banks that offer these unique accounts are FDIC-insured, so your money is protected up to the maximum amount of $250,000 per account. If you open a savings account with an interest rate of just 0.01 percent, it will take you much longer to reach your financial goals. For example, if you open a high-interest savings account, you can earn an interest rate of 1.80 percent APY – an interest rate that’s 180 times higher than the rates offered by most large banks. If you deposit $10,000 in a traditional savings account at a large bank that pays 0.01 percent APY, you’ll earn just $1 after a year. By contrast, that same $10,000 deposited in an account with 1.80 percent interest will earn $180 in one year. High-interest savings accounts are better than other investment choices and are more flexible. Unlike CDs, which penalize you if you make a withdrawal before they mature, high-interest savings accounts allow you to make up to six withdrawals or transfers from your account each month. You’re also able to open an account online (in just seconds!) and can access your information from your mobile phone or laptop 24 hours per day, seven days per week. You can transfer money into your account electronically at any time, and you can link your new savings account to an existing checking account to transfer money as needed. Online savings accounts may function like regular savings accounts, but they come with many more perks. You can also send money to your account by wiring funds to your online bank. Or, another option you can choose is to purchase a money order and make it out to yourself. Some online banks have scanning capabilities, allowing you to scan your money order to make a deposit. If yours does not, you can simply mail the money order to the bank’s headquarters to make your deposit. Need even easier access to your high-interest account? Many online banks lets you link your online savings account to Paypal and transfer money from Paypal. Transfers from Paypal or from your traditional bank to your online savings account may take a couple of days to be processed. Ready to open a high-yield savings account? There are plenty of options: today, high-interest savings accounts are offered by many different banks, investment companies, and financial providers. Make sure to compare interest rates so you’re getting the best rate available. You should start by researching the different offers available. There are numerous options available that pay more than 1 percent interest. Some of these accounts require no or very minimal opening deposits, but some may require you to keep a high minimum balance. After you’ve researched the different accounts and chosen one that meets your needs the best, you can open your account online by going to the online bank’s websites. Most of these websites allow you to apply online by completing a form. Once it is approved, you can then link it to your checking account and transfer funds directly to it. If you’re trying to build up your savings, choose a high-yield savings account instead of a traditional savings account. These accounts are simple to open and pay as much as 180 times what the large banks pay in interest on a typical savings account. When you open a high-interest savings account, you’ll be able to meet your savings goals much faster while still enjoying easy access to your money.